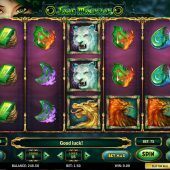 Jade Magician slot has an Oriental theme as do about half of the games nowadays, but that's not necessarily a bad thing - after all fortune and luck play a large part in those cultures, so does any of that apply here? The game has 15 lines with nice graphics and the archetypal Chinese music overlaying the spins so is easy on both eye and ear. All the symbols are stacked and take the form of various Oriental items and icons including White Tigers, Dragons and Gemstones so it's nice to see a departure from the usual tedium of card and number symbols. The first observation the player will make is that the game offers 'adjacent pays' seen in games like Novomatic's Power Stars which means 3 consecutive matching symbols on any pay line will award a win, i.e. on reels 2, 3 and 4 or 3, 4 and 5 too. There is only a single Wild in Jade Magician and that appears on reel 3 and multiplies any wins 2x. The Jade Magician, well she appears on reels 1, 3 and 5 and will trigger a quite entertaining bonus. First of all she offers a 'second chance' pick-me if she appears twice. You are offered 4 symbols and may reveal the third scatter necessary! So, one you've earned the 3 scatters either by reels 1, 3 and 5 or the second chance feature described above, you are awarded 5 free games. This may seem low but you can retrigger them and if you don't then any Jade Magician scatter appearing adds an extra free game, or 2 free games for a pair of them. You don't get the second chance feature though, just the 2 extra games only. The enhancement is that the Jade Magician scatters also become 1x Wilds when appearing and you can still get the base game's 2x Wild on reel 3 too. Given that the 5-of-a-kind awards are quite high as you would expect for a 15 line slot , there is some serious potential here! The highest - paying dragon awards 2500 coins for a 15 coin basic bet which is 167x stake and even the lowest icon awards 5x and of course there is a 2x Wild possible. It is also worth mentioning multiple lines of them can be awarded due to stacked symbols and in free spins the scatter/Wild can appear next to the highest symbol.